Car Carriers and Strollers Identified as Cause of Thousands of Emergency Room Visits for Children | Robert W. Elton, P.L. When you strap your child into a car seat in your vehicle to go anywhere in Florida, you expect that the manufacturer has put in many months of appropriate testing and analysis in order to ensure that the carrier is as safe as possible. The same goes when you strap your child into a stroller after you’ve exited the vehicle and need to go somewhere. Unfortunately, however, a new study reveals that these may be at high risk for injuries and accidents. Defective car seats may even form the basis of an Ormond Beach products liability claim. This news is even more disconcerting if you have been involved in a car accident caused by another driver. Your child may sustain injuries from the accident itself but also from a defective or improperly installed car seat. It is imperative to ensure that you have read all of the safety materials and put the car seat together with all of the recommended guidelines inside the manufacturer’s instructions. However, all of that hard work can fall to pieces if the product has not been properly made and instead injures you or your child in an accident. Many parents are familiar with the concept that baby products are not always safe. Unfortunately, an alarming number of products and toys geared for children can be extremely dangerous and form the grounds of a Florida product liability case. In order to help prevent injuries with your child, you as a parent should always ensure that children are appropriately buckled into carriers and strollers. Avoid hanging any items from handles or on the outside of the car seat and make sure that the car seat is appropriately sized. According to a new research study published in Academic Pediatrics, every single hour two children aged 5 or younger are treated for injuries in emergency rooms associated with a car carrier or a stroller. This translates to approximately 361,000 toddlers treated in hospitals for tip overs or falls during a 21-year period that concluded in 2010. 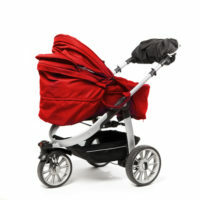 Children may suffer a broad range of injuries if they are hurt in a stroller or a car seat accident. If the manufacturer is responsible for design defects or other problems that make their product unsafe, that manufacturer may be held accountable in court via a Florida product liability lawsuit. Children are most likely to suffer head injuries and face injuries. Approximately 62% of all the incidents recorded in this recent study involved head injuries and 25% involved face injuries. Any injury for a child has the potential to lead to devastating consequences and developmental issues for a child but this is particularly true when they sustain a head injury. Even if the majority of injuries from car carriers are bruises and simple bumps, a concussion and more severe brain injuries can translate to big problems for younger children. Concussions in fact can have significant long term ramifications when they happen to younger children. Since 1990 the number of car carrier related brain concussions and injuries tripled from approximately 17% to more than 50% in 2010. Further research is being conducted in order to determine exactly why this increase happened but parents should be aware that nearly 7% of the children injured in a car carrier accident had to be hospitalized. Get a Doctor’s Advice Immediately After an AccidentHaving a doctor evaluate your child for potential injuries as soon as possible after the accident happens is critical towards protecting him or her over the long run. Since children are extremely susceptible to developmental problems and other issues associated with head injuries, it is always better to be safe than sorry and to head to the emergency room immediately after an accident happens. These critical moments could be the time in which a doctor identifies symptoms or conducts tests that reveal further problems. As a parent dealing with a child who has sustained a significant diagnosis, it can be frustrating and overwhelming. Consulting with an experienced Florida products liability or personal injury attorney depending on the facts of your case may be the only way to recover compensation and help to support your child’s recovery and a better future. Do not hesitate to reach out to an Ormond Beach attorney with experience in personal injury and product liability. Does a Disclaimer Mean You Cannot File a Product Liability Lawsuit?